Although pre-production on Phil Lord and Chris Miller’s young Han Solo spinoff has been underway for some time now (operating under the clever codename “Red Cup”), today marks the full, official start of production. To celebrate, Lucasfilm has debuted the first photo of the cast and their directors, crammed together inside the cockpit of the Millennium Falcon as if posing for a very cheerful (if a bit tardy) holiday greeting card. 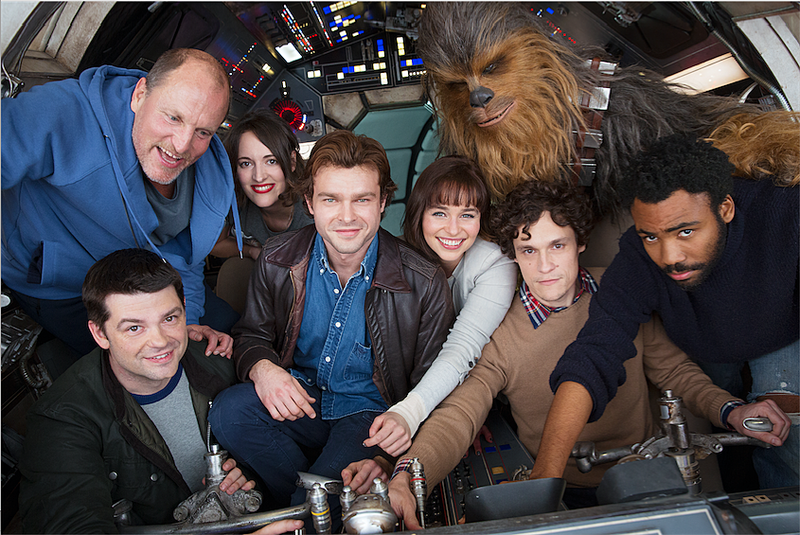 Pictured above are Alden Ehrenreich (sporting a new, Harrison Ford-esque hairstyle), Woody Harrelson, Emilia Clarke, Donald Glover, Phoebe Waller-Bridge (I still can’t get over the fact that this genius woman is going to be in a Star Wars movie), Chewbacca (obviously) and directors Phil Lord and Chris Miller. Ehrenreich is, of course, playing young Han Solo, with Glover as young Lando, Harrelson as Han’s mentor, Waller-Bridge as a new female droid (a first in the Star Wars universe), and Joonas Suotamo as Chewie. The roles of both Clarke and Thandie Newton (not pictured) remain unknown. The Han Solo spinoff will hit theaters on May 25, 2018.